It’s 1 am, you’re hungry and you’ve only got $5. How do you figure out what the maximum amount of grub you can snag inside that budget is? You could try to do some drunk math but that’s never going to work out. Or you could try the time-honored method of rolling up to the drive through and scrounging for coins in the ash-tray because you’ve over-estimated your wallet size. That’s what the TechCrunch hackathon Taco Bell Disrupt is all about. 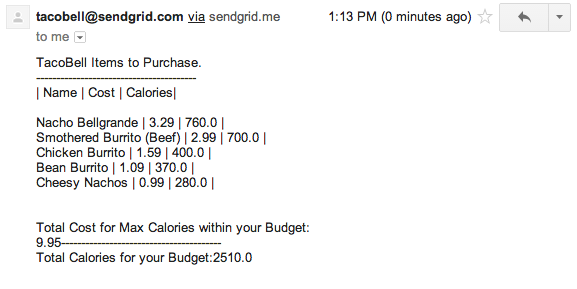 You shoot an email off to a special address with a dollar amount in the subject and it rips you off a menu of the maximum amount of food you can get under that limit. The list comes back with a list of items and the cost to you, as well as calorie counts to help you see exactly how much coal you’re giving your internal furnace. It’s actually a very simple, kind of funny but very clever hack — just the kind of thing that we like to see at the hackathon. The hack was created by Kunal Batra, a Developer Evangelist at Sendgrid who came down with a friend just to have some fun. He scraped the Taco Bell website to snag the data and used a python backend to compile that together into the menu. Batra says that the genesis of the hack was a Taco Bell trip taken at 3:30 on the day of the hackathon after he really couldn’t figure out what to make. While he was there he had a brainstorm about maximizing the amount of food you could get for your money. This kind of hack is fun to me because it’s relatively simple in nature and seems frivolous on the surface. But, if Batra decides to productize it, I could totally see it taking off with college kids and people with limited money to spend on food. Add in more restaurants and dining options — and maybe allow people to search by calorie count if they’re on a diet — and you’ve really got something. And the model could also be applied to things that are more practical after you grow out of late-night taco runs. What about figuring out how many groceries you can stock in the fridge with a fixed income, or how many toys you can afford to buy your large family? Very cool possibilities, exactly what we love to see at the hackathon. If you want to try it for yourself, send an email to tacobell@sendmail.io with just a dollar amount (no dollar sign) in the subject and nothing else. Happy taco-ing.